Yes, our technicians are fully trained and accredited with various industry bodies, including Microsoft. Do You Come To Me Or Do I Drop The Computer In? 1. Our technicians can visit you for an on-site review and repair. 2. You can bring it in today, pick it up tomorrow. In a hurry? Ask about our Express turn around times (Fee Applies)- overnight service/repair – Drop off close of business & pickup next morning! What could be easier?! 3. New! Save big money and have our expert technicians simply login to your computer using a remote secure connection and diagnose and fix the problem as soon as possible! 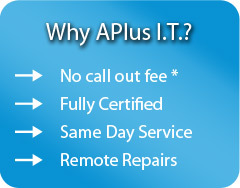 On-site computer repair is just $99 per hour plus GST. Dropping your computer in – there is a small $45 fee for diagnostic and quotation – this fee is waived if the repair is approved and the requested repairs completed (not applied to data recovery services). Remote computer support – fee per incident is just $35 plus GST per half hour (minimum 1/2 hour). Networking fees start at just $115 plus GST per hour for basic networking, to $135 plus GST per hour for server-based networks. Please note that we have 1 hour minimum charges, plus parts (if applicable) – time after the first hour you will be billed in 15-minute increments. We have a 100% guarantee – if we cannot diagnose or fix the problem, or provie a solution, there is no fee. How Much Is Your Call Out Fee? If you’re on the Southern Gold Coast call out is free. Other areas attract a call out fee of $45 – this covers travelling time and those ever increasing petrol costs! How Quickly Can You Come To Fix My Computer? Can You Fix My Computer By Logging Into It From Your Office? Yes! We have the latest technology that enables us to securely login to your computer, diagnose and fix many issues. This is a very effective and quick solution – and saves you money. Full details on remote computer repairs here. We have a policy of no fix, no fee. If the problem is a hardware failure and you do not wish to purchase the recommended fix, then a fee applies for the diagnosis at our usual rate. What Do You Do Besides Computer Repairs? For any other questions simply contact our friendly team and we’ll take great care of you!